"Who Else Wants To Learn How To Hypnotically Put Anyone Into A Trance In Seconds So They Obey Your Every Command? " "Learn The Same Secrets That Professional Hypnotists Have Been Using For Years To Direct The Thoughts Of Others With Ease"
My name is Steve G. Jones and for over twenty years I have helped thousands of people achieve the kind of life that they want through clinical hypnotherapy or self-hypnosis. This is a very exciting time for all of us here because I have just set the final pages to what could be the most revolutionary volume in the world of hypnosis. This exclusive secret manuscript contains over one hundred hypnosis strategies for you to use and enjoy for whatever purpose they may suit you. Have you ever wanted to try hypnosis on yourself or someone that you would like to persuade or influence? Do you feel that your quality of life would improve greatly if you knew how to use natural hypnosis to persuade others? Have you ever wanted to improve yourself without having to pay thousands of dollars in therapist’s fees? Do you want to show others how skilled you are in the mind arts? Have you ever wanted to erase bad memories and focus on good memories and your successes in life? If you said yes to any of the questions above, then I invite you to read on because this may be the most important letter that you will ever read regarding hypnosis and how it can help you achieve your goals. Hypnosis is both a science and an art. It is an art because the basic concepts of hypnosis have been around for thousands of years and has been used by ancient leaders, politicians, statesmen, scholars and ordinary people like you and me. The difference (between the then and the now) was that people didn’t know it was hypnosis back then. They only knew that some people had this uncanny ability to talk to people so well that they got what they wanted.And in the final analysis, that’s what hypnosis really is – it’s an almost magical way of communicating with people so that they would really focus on what you are saying and nothing else. Hypnotists are both born and made. Some people have the natural ability to hypnotize people with body language and words while the majority of people (including me) have had to learn how to do it.But that’s alright because natural hypnotists are extremely few and far in between… and most of them don’t even know how to relate their skills to people.So you might be wondering at this point in time: what’s in it for you?Let me explain: hypnosis is actually a natural trance state. People experience different kinds of trances on a daily basis. The most mundane things and activities can trigger a trance (like reading a really good book or watching a football game). The human mind has the ability to focus intently on something for a prolonged period of time if it really wants to.So if someone could focus intently on what you have to say and what you want the other person to do then… You can already imagine the power that you could wield over others. But of course, I ask that you use this immeasurable power ethically because you will literally be accessing the other person’s conscious thinking and subconscious mind through hypnosis. Hypnosis is not magic, pranking or guesswork – this is as real as it gets! Don’t confuse self-hypnosis with “hypnotism” as it is portrayed by TV! Hypnosis is not magic or voodoo where people are forced to sound like chickens and dance around in front of an audience. Hypnosis can never be forcefully used on anyone because the hypnotic state is natural to begin with and a person can always snap out of a trance if he really wants to. Hypnosis cannot be used to command people to steal from banks or jewelry stores. Hypnosis is not a form of religion nor is it affiliated with any cult. Hypnosis is not a weird technique used by ‘evil hypnotists’ to prey on innocent bystanders. Hypnosis is primarily a form of harmonious communication that allows you to reach out deeply to one or one hundred individuals. Hypnosis can be performed openly or covertly (secretly) through the use of hypnotic language patterns. Hypnosis can help you overcome present difficulties connected with your personality, self-confidence, etc. Hypnosis can be done anywhere and anytime, without the use of any tools. If you want to use pendulums or similar items, you have the option to use them as well – but they are not a strict requirement. And the best part about learning hypnosis at home is you won’t have to spend thousands of dollars attending seminars that may not even teach you everything you need to know so you can safely practice hypnosis! We Don’t Abuse Or Share Your Information EVER! I will let you in on a little secret. You can read dozens of books on hypnosis and you can listen to endless lectures on the subject. But in the end, you would still have to make sense of all the information that you have just learned… and 90% of the stuff that you’ve heard will not help you become a better hypnotist. Why? Because most courses on hypnosis are structured in a way that you have to go through a lot of fluff and fiber before you get to the meat of the subject, which is really what you need in the first place. As a master hypnotist in training, you need actual usable techniques that will make hypnosis as easy as apple pie. You don’t need fluff or useless details that won’t even contribute to your practice of hypnosis. Unfortunately that’s what hypnosis courses are usually made of – lots and lots of fluff. Because frankly, it’s hard to produce a course that will bring a lot of satisfaction to people without having to devote oneself to the theory and practice of hypnosis for many, many years. Hypnosis is a natural trance state – there is nothing forced or strange about it at all. We all experience trance states while doing other things. All hypnosis is self-hypnosis; no one can force a person into a hypnotic state of mind. Everything associated with hypnosis is voluntary and conscious. When a person (including you) is under a hypnotic trance, everything is much clearer and brighter. The mind becomes more open to suggestions of every kind. A hypnotized individual can be persuaded or influenced more easily because the subject would actually be giving the hypnotist the keys to his consciousness from start to finish. Hypnosis can be done on a whole group of people; there is no limit as to how many people you can hypnotize. Your skills as a hypnotist will triple as you practice it. Practicing five to ten minutes a day will already place you in an excellent position to become a master hypnotist. There is nothing difficult at all about hypnosis. Anyone can learn it no matter how old you are or how little you know about the process in the first place. It’s a bit like riding a bike; there’s a little uncertainty in the beginning but after a few successful attempts the whole process becomes so natural and easy that you won’t have any trouble mastering it. A hypnotized individual is in a good position to erase bad memories, focus on great memories and increase the impact of past successes. Hypnosis is actually the doorway to covert mind re-programming. The process works on anyone! Why should you try hypnosis? Because it flat out works. We all know that medical doctors don’t usually pay attention to alternative techniques. But even doctors grudgingly acknowledge that benefits of hypnosis, even if it works without any visible clues as to how it operates the mind and the body. All doctors know right now is that hypnosis has the ability to completely relax the human body to the point that even blood pressure and pulse rates are lowered. This only confirms the fact that the mind and body share a much stronger connection than we have previously thought. Decades ago, people thought that the imagination did not have any connection at all to the body. We know better now. We now know that the human mind plays a crucial role in maintaining the health of the physical body. Hypnosis actually gives you dominion over your body and mind. It gives you control. It gives you an accessible path that allows you to accomplish specific goals. Sometimes our own minds can be resistant to our desires. Hypnosis bypasses the usual obstacles that we encounter when we are trying to enforce a change in the way we think or behave. It’s like this secret key that unlocks the mind. Hypnosis can be used on yourself and on others through the process of induction, deepening, hypnotic suggestion and awakening. AND THE LIST GOES ON AND ON! As you can plainly see from the list, hypnosis can tackle more than a handful of different conditions. And yes – there is a way out of physical pain without popping pills. And this is the reason why I am so excited for people to start hypnosis because it really can work magic in people’s lives. I stand by my belief 100%! It’s finally here – the BIGGEST and most comprehensive audio course and guide to the world of hypnosis. This audio course has been designed for both beginners and intermediate/advanced practitioners of the art of hypnosis. It doesn’t matter if you don’t know a thing about hypnosis to begin with – my audio course will guide you through every relevant nook and cranny to ensure that you know everything you need to know about hypnosis before you even start. Unlike other courses that focus on giving its users or readers pure fluff, this audio course picks apart existing knowledge about hypnosis and provides you with the actual applicable lessons needed by any master hypnotist in training. Unlike other courses, you won’t have to deal with a lot of introductory material that doesn’t even hint at what hypnosis really is and how you can use it. I’ve taken away all the useless stuff so you can apply the techniques immediately and safely. So whether you want to try hypnosis on yourself or on someone else, all the knowledge you will need is contained in just one course that you can review at your leisure at home, while running or even while driving. This audio course does not contain hypnotic scripts (or at least, active scripts) that would make you relax too much or fall asleep. What it does contain is techniques and miscellaneous tips that will enhance your experience with hypnosis. You can listen to the audio course any time you want (even while operating machinery or while driving to work)! Are you ready for an exclusive sneak peak? Here’s what’s waiting for you on the inside! The truth behind hypnosis and why popular depictions of hypnosis are not only false but largely useless if you want to actually practice hypnosis on yourself or someone else. Hypnosis cannot be forced on someone who doesn’t want to be hypnotized in the first place! Hypnosis isn’t a form of magic either – though some people think it is a little magical because it works so beautifully when the practitioner is able to use the proper techniques. How to use a simple and straightforward technique to create goals for yourself as a hypnotist. This technique can also be used during a hypnosis sessions to enhance the effectiveness of your hypnotic suggestions. The different ways that you can benefit from hypnosis yourself. Remember: you can hypnotize yourself and those around you to accomplish specific goals. Don’t feel left out – try self-hypnosis if you want to boost your confidence level or even erase bad memories. How the subconscious mind actually works with the conscious mind when a person needs to think, speak and act. The subconscious mind is not a slave to the conscious mind. In fact, recent studies show that the subconscious mind is actually the leading component of the human mind. The conscious mind is actually following the whims of the subconscious! How internal representations can be used to communicate with the subconscious mind of people. The human imagination speaks a different language – find out how you can send clear messages directly to a person’s subconscious mind during a hypnotic trance. The difference between merely saying and stating as a fact. Hypnotists must be able to speak as though the subject wholly depends on the hypnotist during the hypnotic trance. How you can become effective and authoritative during a hypnosis session. If you are not authoritative, your subjects may not respond well to what you want them to think or do. The oldest and most effective way of hammering new truths into the subconscious mind. This technique has nothing to do with the swinging pendulum or the weird hand gestures of the hypnotist! How you can prepare a person adequately so that he becomes an ideal hypnotic subject. Not all hypnotic subjects are responsive; you can avoid this problem by following this simple preparation process. How you can induce hypnosis without using anything but your voice. I will reveal to you the quickest and most powerful hypnotic induction techniques known to man. Use these techniques ethically! Use deepening scripts to ensure that the hypnotic subject is deeply immersed in the trance before you start giving hypnotic suggestions. How you can utilize visualization techniques so you can enhance a subject’s hypnotic trance. Obviously, it would be very difficult to share with you all of the contents of the audio course here… And this is just the tip of the iceberg! Tell you what, I’ll give you full, instant access to the ENTIRE audio course right here and right now for just $37! I have devoted countless hours of research and refining into the development of 101 Ways to Hypnotize Anyone and I am absolutely CONFIDENT that it will satisfy your need for hypnotic knowledge. This audio course is not available anywhere else in the world – it’s not on Amazon, Audible or any other website. It is an exclusive audio course targeted for visitors of my personal website. I am so excited that you have come here to witness the launch of probably one of the largest collections of hypnotic techniques and strategies in the history of hypnosis itself. Few master hypnotists actually go through the bother of collecting usable techniques to share with the whole world. And frankly speaking, many master hypnotists don’t like the idea of sharing their knowledge to others because they think it would make them look bad somehow. I don’t believe in such nonsense! I believe that any kind of knowledge will only be useful if you are able to share it with the world. I also believe that something this good must be enjoyed and shared by people who are interested in hypnosis or have a passion for it. If you want to accomplish amazing things with your mind and with just your words, hypnosis is your Golden Ticket to so many possibilities because it literally has no boundaries. The only limitation that you may encounter is perhaps your own personal limitations when it comes to using hypnotic strategies yourself. But apart from these natural personal limitations, the world is that much bigger and more inviting now that you have the opportunity to use hupnosis every single day if you want. I am so confident in my audio course that you can keep it for sixty days and if you think it’s worthless – drop me a line and I’ll give back all of your money AND you can keep the audio course as a sign of good will from me. I’m the one taking all the risk here — that is how much I want YOU to enjoy all of the benefits of hypnosis. Remember: You can sign up for endless seminars and lectures and still not get the important information you need to safely and efficiently practice hypnosis. Would you spend 200 to 300 hours of excess learning time just to sift through fluff? Of course not! You want the best and I’m offering you the absolute best option for learning hypnosis, bar none. PS. 101 Ways to Hypnotize Anyone is a revolutionary audio course that takes you deep into the heart of hypnosis so you can start practicing your new skill today. Not tomorrow, next week or next month after an online exam. I’m talking about a few hours from now? Isn’t that amazing? PPS. I could easily charge $1,000+ for the entire course, but I’m more interested in getting this material to the most number of people in the shortest period of time. 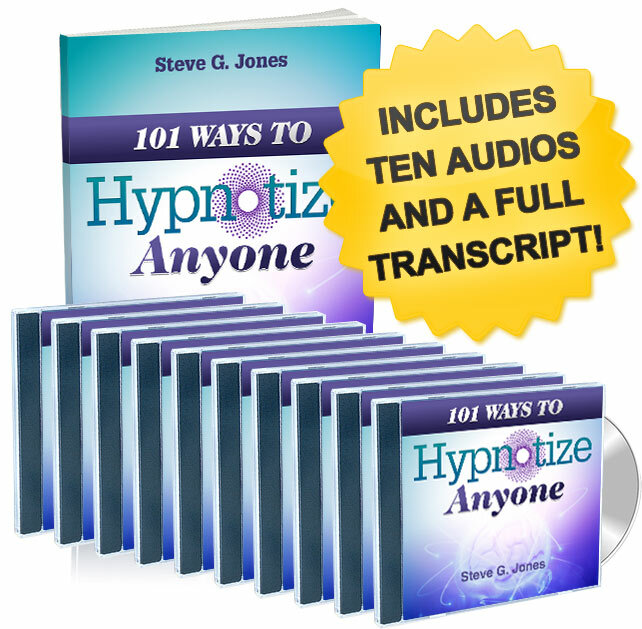 Download 101 Ways to Hypnotize Anyone instantly!